21 August 2014. AliveCor Inc. in San Francisco says the U.S. Food and Drug Administration cleared an analytical processing algorithm to detect atrial fibrillation by its heart monitor designed for smartphones and tablets. 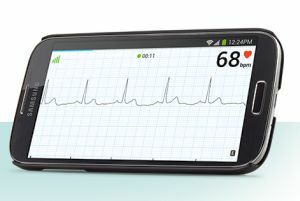 FDA already cleared the basic AliveCor mobile device heart monitor system for marketing in the U.S. in February 2014. The company’s heart monitor and software work with mobile devices running Apple-iOS or Android operating systems that record heart rhythms like an electrocardiogram. The AFib Detector, as it’s called, is a new software module expected to be added to the heart monitor system in September. Atrial fibrillation, or AFib, is an irregular heartbeat that can lead to stroke or heart failure, and affects some 2.7 million Americans. With AFib, heart muscle contractions in the upper chambers beat irregularly instead of in a regular rhythm, which can cause blood to pool and lead to blood clots, including those that move to the brain and cause a stroke. Some 15 to 20 percent of stroke victims have this kind of irregular heartbeat, and left untreated, people with AFib are 4 to 5 times more likely to suffer a stroke. While some people with AFib report symptoms, such as a racing heartbeat or light-headedness, many people with the condition experience no symptoms, making it difficult to detect. The AFib Detector, says AliveCor, reports the condition in real time for quick action by patients and physicians, which can be particularly important for people who do not experience symptoms. The AliveCor heart monitor sells for $199.00 in the U.S. and fits on iPhones and most Android phones. Users first download a free AliveECG app from Google Play or the App Store to their phones, and create an account with AliveCor. The device is strapped to the hand and held over the heart to record heart rhythms. The system detects heartbeats as electrical impulses from the fingers holding the device and converts those impulses into ultrasound signals picked up by the microphone on the smartphone. Heart monitor data are stored in the device and on secure servers at AliveCor. People using the system can give their physicians access to their heart monitor data, or produce reports in PDF format. The company provides as well an expert review of the electrocardiogram data by technicians and cardiologists for an extra fee. This analytical service is available in the U.S., U.K., and Ireland.